Summer 2009 may be the Summer of Art. This year there is a new face on the party circuit… the face of Art. Art has been turning up all over Kingston. Mystic Urchin’s Brand New Machine on Wednesday, May 6 at Fiction: Art was there. And last weekend at Red Bones, Rock Paper Scissors served Art on the lawn with an entree of live rock music. Are we bored with the homogenous soullessness of the “now” party scene? Are the gimmicks getting old and the themes a little hollow? Do we want someone else to look at besides the 150 tired faces we see every weekend? Well… who knows? But the fact is Art is in town and the pARTy is here for the Summer… So, step right up and get your Art! The Buy Art Campaign is an awareness initiative and art party (pARTy) series produced by The Higher Intelligence Agency (HIA) has an aggressive viral campaign to activate a social movement based on the need to support the arts, foster aspiration and create incentives for art ownership, de-stigmatize the idea of “selling out”, enable artists to get involved in their own promotion and create positive friction to encourage people to Buy Art. Speaking about SEDITION, featured artist Stefan Clarke recalls, “Once you entered, you had to walk a path through images from the collection projected onto stretch fabric screens. The path carried you to the roof where there was a DJ, bar and another set of screens showing images from the collection. The event was an art piece in itself and the guests were part of the Art.” For Stefan, this was the first of five shows he has planned for the year. The pARTies are intended to get you and me interacting more with Art, and leaving with a sense of fulfillment and connection [with Art and each other]. If SEDITION was any indication, people really do want to see more of Art – and not in a stuffy room with a bunch of boring intellectuals. Maybe next time Art will perform, or scandalize someone (Art does have artistic license), or say something really profound. What’s for certain, Art is unpredictable, edgy and definitely worth watching. All that’s left now is for you to introduce yourself to Art – get to know Art. There’s a whole lot of stray Art out there, looking for a home. 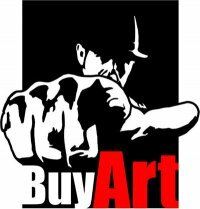 So meet Art, Buy Art… so we don’t have to kill our Art for food.